This is the Tipi dream: Creating Godwalkers. What we’re really talking about here is the building of a very special spiritual retreat from scratch. The Tipi is the first step and the central focus of the project. When done, it will be a special place to come and perhaps “smoke the peace pipe with God”. When was the last time you actually set a few days apart to hear God, and talk to God in a really serious way? Sometimes we need to sit with God in the stillness of our soul, and smoke the peace pipe. I’m not talking a physical pipe, but a spiritual one. Sometimes we need a fresh start with God, or new vision, or a revelation, or perhaps simply a deeper drink of the Holy Spirit. When was the last time you set yourself aside to God in a special place to seek his face? This was a common practice with old time saints, but almost unheard of in our modern church. It seems a retreat today consist of being in a group with lots of other people, going to some fancy building somewhere and listening to special speakers “talk at you for God”, followed by nice meals, special events, hopefully some prayer time, but very little just getting alone with God in a place of “simplicity”. This will be “Tumble Pigeon Farm”. When I headed west from Indiana to South Dakota on a mission to hear God, I did not realize how much I was going to be affected by the life of a man named, Korczak Ziolkowski. God knew what he was doing. I did not know that in just a few weeks I would realize I had some land in a quiet country setting ready for me to begin building. Korczak is the sculptor who began creating “Crazy Horse Monument” from solid rock. I had taken my family there some twenty years ago, my wife and all five kids. At that time all I was interested in was Crazy Horse. I was somewhat fascinated with Indian ways. It was amazing what Korczak was doing, but for me, it was all about Crazy Horse, including my climb up Bear Butte where Crazy Horse had his vision. I did not know what God was doing even back then. He was planting a seed, laying the ground work for when I would come back twenty years later, a blink of the eye to God, but a long journey for me. I would come back defeated, lost, broken, and looking for new inspiration. I would be at the beginning of the Third Act of my life and not wanting to waste it. The next time I came back, all I would see was Korczak! (And his amazing family.) God did this. God had it all planned. We violated “our” plan that day. Our plan was to spend maybe two hours at Crazy Horse. Just long enough to see the progress made in twenty years and also buy some cool Indian stuff. We almost did not even bother with the Introduction Video. I had seen it twenty years ago. But something somehow drew me in there anyway, almost against my will. I figured I would get bored quickly and simply walk out, but that’s not what happened. It was as if I was seeing “Korczak” and his incredible “Legacy” for the very first time! I was captivated! I soon discovered my wife was captivated also. We couldn’t walk away from the place! We took the tour bus down to the foot of the monument. We ate in the restaurant and I had Buffalo Beef Stew. We bought books and videos on Korczak and his family. I watched our time melting away and knew we were not going to make it to our planned destination. We both decided on a new plan, just so we could soak up everything God had for us there, but I still did not realize I had the opportunity to do a very similar thing coming my way. That did not hit me till two weeks later, while at work pushing wheelchairs. The vision God had for me, and the assignment for my Third Act, was to build something, and of all things, it began with a large wood Tipi. My sister would later refer to it as a “structure of coming together”, and so it has been for our family, and eventually will be for others too. As I have worked on this structure, you cannot help but be impressed by its simple design, and yet amazing strength! And what is the design so simple and strong? Beams leaning together on each other, coming together at a common point. Do I really need to explain the spiritual analogy of the church? Jesus is the common point we come together, leaning upon each other, we are strong in God’s simple design! And so a spiritual retreat called: “Tumble Pigeon Farm” begins. Perhaps this is a good time to explain the birds. My dad has had Tumbler Pigeons for years. I consider them to be an interesting picture of most Christians, but not a good one. One of the goals of our retreat is to impart a vision of becoming a bird of prey, and not being the prey. Tumbler Pigeons fall a lot. Some cannot even fly because the moment they flap their wings and try, all they do is go tumbling across the floor! You can google these birds for in depth information, but basically, the type my dad has do fly. They fly in a circle around and around the barn they live in, but as they fly, one or two will suddenly flip backwards and start tumbling towards the earth! Craziest thing you ever saw! Most of the time they straighten out before hitting the ground and rejoin the flock, but notice I say “most-of-the-time”. Every once in a while one will tumble all the way to the ground and break its neck upon impact. These birds are a sad picture of many people I know, but God says: Learn my ways. Eagle ways. Tumble Pigeon Farm offers solutions to this condition. We are not here to point out problems and offer no solutions. You see, living in Indiana we do not have eagles (sad to say), but because of these pigeons, our land has attracted Hawks! (A bird of prey.) Spiritually speaking, we are called to be the hunters, not the prey. So in some ways, by God’s design, our farm has become a living picture of the two ways we can live our life in Christ. Now I’m going to state a couple facts, and it is not meant to brag, it’s just fact. I’ve had sixty-two years exposure, study, and practice in God’s word, and I’ve learned a few things. I’ve learned a few things that seem to be very different than what the average church is teaching, and God wants to share this knowledge, this way, with whosoever will. You can be the hunter, not the prey. But what are you hunting? Will you waste it on earthly things, or walk with God? Do you see Jesus as the prey? Was he not here to overcome death? Was he not hunting it? Did he not enter into the arena of death, by the will of the Father, to defeat death not only for himself, (since he was technically dead), but also for “US”! Was there ever a bigger hero? Was there ever a greater hero’s journey? Was there ever a braver quest, greater hunt of a foe, than our Lord undertook? Was he really the prey, or was he the hunter? Satan wants you to believe he was the prey, so he can keep you that way. He wants to keep us deceived, fearful, tumbling, and peeking out of our little man-made nest, the four-walls of our little man-made kingdom, instead of our lives filled with the vibrant power and peace of the Kingdom of God! He knows when we see the “truth”, he will be the hunted, he will be the prey, because we are called to be eagles, not flapping little sparrows. This page is dedicated to recording the building of “Tumble Pigeon Farm Spiritual Retreat / School in the Wilderness”. In order for this to happen, God is going to have to bless me with more years and strength than I have any reason to believe I deserve, but as a hunter, I’m going for it! I don’t know how many pictures a page can hold, or how long a page can be before it might blip out on me and be gone? But if it holds, this page will be very long. It will be added to regularly. This has been my Introduction. What needs to follow is the Tipi Journey thus far, where we are now, and the growth as we progress from here. I hope you have an interest in such spiritual growth as this, and maybe someday, you might even be one who comes to visit a school in the wilderness called “Tumble Pigeon Farm”. I have a book written that I am now editing and hope to soon publish. It is a story of learning to flap less, and soar more. It is about a school in the wilderness. God gave me this story years ago. Now perhaps it will be more than just a story. We shall see. My first attempts to raise the “tripod beams” on my own ended in failure. This led to a family day in which many of my grandkids, and family were able to come together and set the tripod. It was a hot day and a great strain on me, but it eventually, many weeks later, grows to this. This Tipi is not small inside. After the tripod beams were set, I was able to drag the other beams up a tall ladder, 22 feet up, and with a little help from my 86 year old dad, fasten them in place. All fourteen beams! Wow. It really was a lot, and a lot of work, but I have loved it. I’m feeling an urge from God to find a new job, one that is much closer to the Teepee in Whitestown Indiana. I’m also feeling I am meant to set up a living space in one of the small farm buildings and actually spend more time living there. 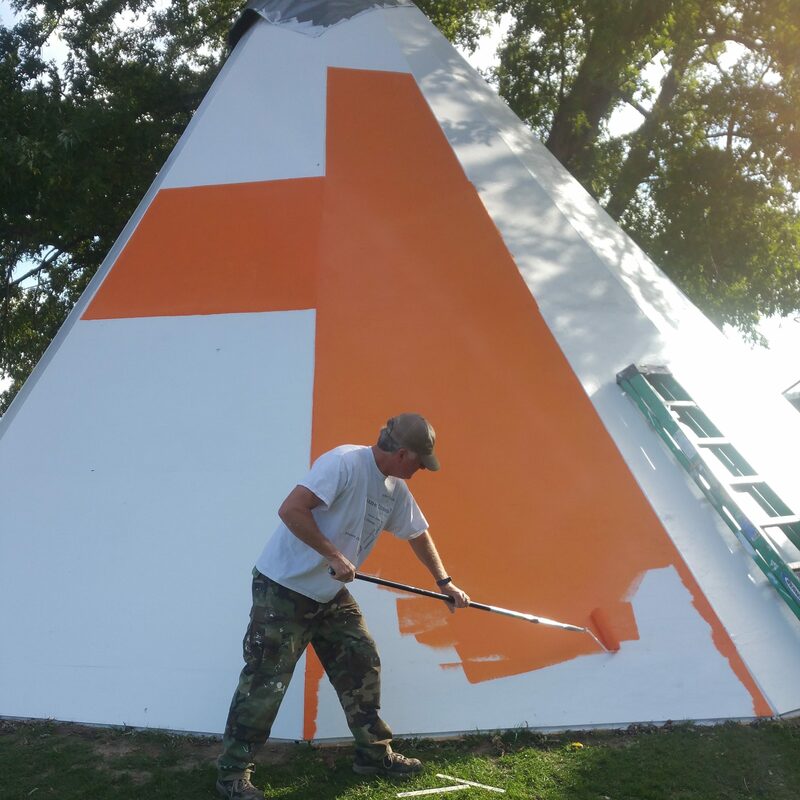 The Teepee is not yet ready for its grand public opening, that should come in the spring, but God is showing me a change of plans in how I thought the design was going to be. I’m excited about this change I see! So…I’m headed out today to do a little job hunting, and we shall see what might be. Then I will go to farm and surprise my mom and dad that I intend to move into a certain little building they have, currently empty. I’ll try to get some pictures. Tiny house living for sure! Hopefully, I’ll update this page soon, with how all this goes, but for now, here’s a few current shots of God’s Teepee.